Victims are now in a safe place because of the danger of more violence. A mob of angry Muslims beat and humiliated the two women, who are mother and daughter. The incident was triggered by a domestic dispute between them and the Muslim wife of their son and brother. A Pakistani priest says that unless there is separation between state and religion, Pakistan will slide into civil war. Lahore (AsiaNews) – Two Christian women, mother and daughter, who recently suffered violence and humiliation, are now in a safe place. 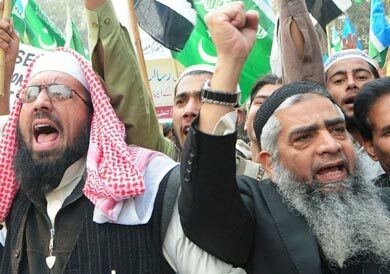 An angry mob turned against them in Lahore, beating them, after they were accused of blasphemy. The incident began with a dispute between the two and a Muslim woman, who is married to their son and brother, over the religious education of the mixed couple’s daughter. Mgr Rufin Anthony reacted to the fact, slamming Pakistani society’s increasing intolerance, a sociological problem it must deal with the utmost urgency. Speaking from their hideout, John Chand, son and brother of the victims, told AsiaNews that the two women “are afraid of being attacked by extremists” and are hiding to avoid being killed. The mob beat Saira Chand and her mother so badly that both lost consciousness. At some point during the attack, some of the abusers put necklaces made of old shoes around their necks, smeared their faces and put them on the back of donkeys to parade around their east Lahore neighbourhood. After regaining consciousness, the two women vehemently rejected the accusations of blasphemy, touching their feet repeatedly, to demand pity from their tormentors. A local Muslim leader, Mian Muhammad Sameer, said he did everything to get the two women to “confess” their crime of blasphemy. “Her hand is so swollen she hasn’t been able to cook since the day of the incident. I’ve been getting my meals from a restaurant,” he added. According to John Chand, the violence was sparked by a dispute between his wife Amina Zaheer, who is Muslim, and his sister Saira, who is Christian, which got worse after the mixed couple had a baby girl. Matters were already difficult from even before. Amina’s father Zaheer Malik had already objected to her marriage unless John converted to Islam. However, the two got married in court and each kept their religion. The issue became more complicated when their daughter was born. John wanted to name her Sonia and raise her in the Christian faith. His wife and father-in-law wanted her to grow up a Muslim. The blasphemy charge was levelled when Saira and Amina had a row that involved Saira’s mother. When Amina left her mother-in-law’s home, she began accusing the two Christian women of insulting the Prophet Muhammad, and this sparked action by local Muslim extremists. Eventually, the two women escaped to safe place thanks to the help of Zameer Khan, an NGO worker, who saved their life. For him, the issue had nothing to do with blasphemy but was just a dispute between two women. Senior Superintendent of Police Zulfiqar Hameed agrees. According to the police officer, it is “a domestic issue” in which Saira was unfairly accused. The problem is not religious or ethnic but “sociological”, one “that needs to be addressed quickly”. “Events have come to this stage in the country’s history where religion is being abused to settle personal scores,” said Fr Xavier Joseph. “State and religion must be separate,” he added; otherwise, “there will be a civil war and that will be the end of the Pakistan as we know it”.